These pads can be used with PSA adhesive back sanding discs. They are for power tools with 5/8-11 arbors. If you need 5/16-24 arbor dual action (DA) orbital pads click here. The pads below are for holding small diameter PSA discs (pressure sensitive adhesive back). They feature a 1/4" straight shank to fit collett tools or drill chucks. 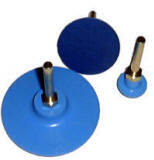 The pad surface is a blue vinyl that provides strong disc adhesion yet makes them easy to remove.